Historic Shimla city finally included in the Smart City Mission. Central government today announced another list of 30 cities for development as smart cities taking the total cities picked up so far to 90 under the Smart City Mission. 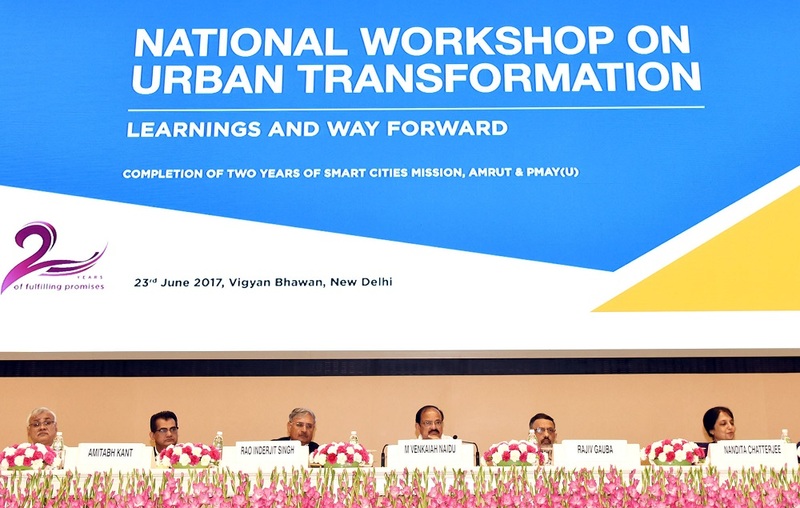 Minister of Urban Development and Housing & Urban Poverty Alleviation M.Venkaiah Naidu, while announcing the new batch of smart cities at a National Workshop on Urban Transformation today, said that 45 cities contested for 40 available smart city slots but only 30 were selected to ensure feasible and workable plans that match the aspirations of the citizens. Shimla, which failed to make to the final list earlier, owing to the political rigging, finally included in the list along with Trivendrum, Naya Raipur, Rajkot, Amaravati, Patna, Karimnagar, Muzaffarpur, Puducherry, Gandhinagar, Srinagar, Sagar, Karnal, Satna, Bengaluru, Dehradun, Tiruppur, Pimpri Chinchwad, Bilaspur (Chattisgah) Pasighat, Jammu, Dahod (Gujarat), Tirunelveli (Tamil Nadu) Thootukkudi (Tamil Nadu), Tiruchirapalli (Tamil Nadu), Jhansi, Aizawl (Mizoram), Allahabad, Aligarh and Gangtok. For newly inducted cities total investment of Rs. 57, 393 cr under respective smart city plans are being proposed, which includes Rs. 46, 879 cr for ensuring core infrastructure in the areas identified by citizens for area based development and Rs. 10, 514 cr for technology based solutions for improving governance, service delivery and utilization of infrastructure. With this the total investment approved under the smart city plans of 90 cities has gone up to Rs. 1, 91,155 cr. For the remaining 10 slots now 20 cities will be contesting. These are; Itanagar (Arunachal Pradesh), Biharsharif (Bihar), Diu (Daman & Diu), Silvassa (Dadra and Nager Haveli), Kavaratti (Lakshadweep), Navimumbai, Greater Mumbai and Amaravati (Maharashtra), Imphal (Manipur), Shillong (Meghalaya), Dindigul and Erode(Tamil Nadu), Bidhannagar, Durgapur and Haldia (West Bengal), Meerut,Rai Bareilly, Ghaziabad, Sharanpur and Rampur (UP).